Taiwan is bracing as a category 5 super typhoon bears down on its coastline. Typhoon Nepartak is expected to bring torrential rainfall and enormous waves in its wake, meaning Taiwan, and subsequently mainland China, could be in for some serious flooding. This comes just days after central China experienced one of the deadliest flood-related disasters in its history. What’s astonishing about this storm is not only how powerful it is—as USA Today notes, it’s the strongest first typhoon of the season to hit Taiwan in over 50 years—but how quickly it intensified, going from a tropical storm on Monday afternoon to a category 4 super typhoon on Tuesday. (A super typhoon is a tropical Pacific storm with maximum sustained winds of at least 150 mph). Yesterday, the storm reached its peak intensity and achieved category 5 status, with winds howling up to 175 mph. As meteorologist Jeff Masters points out over at Weather Underground, ocean waters are a full 1-2 degrees Celsius hotter than usual have fed energy into the storm as it marches toward the coastline. 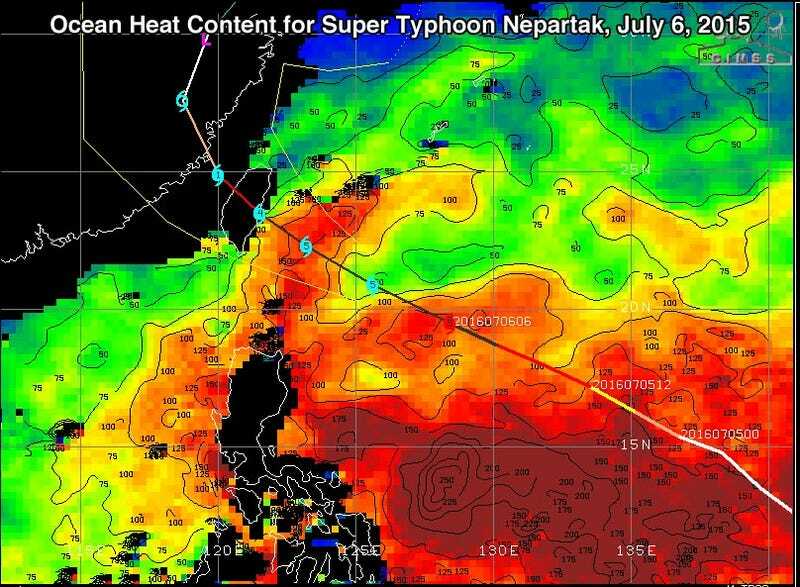 Total ocean heat content in the region surrounding the track of Typhoon Nepartak. High heat has helped the storm to intensify rapidly. Image: University of Wisconsin/CIMSS via Weather Underground. Typhoon Nepartak is expected to make landfall over Taiwan today and reduce in intensity somewhat before churning up the coast of southeastern China. The onslaught of wind and rain could inundate regions of China that are still reeling from a week of monsoon-related downpours that flooded cities and left at least 181 people dead or missing.